We are so excited to unveil our French cross back chairs for rent! These oak cross back chairs are oh so beautiful–I’m even going to steal one to place at my dining table. They can be found at high end furniture stores around Washington D.C. and now, we are offering them as rentals for your special event or wedding. Each French cross back chair has a woven rattan seat and we are hoping to get cushions to offer as an option as well. I hope you are crushing on these French beauties as much as we are! Debuting our French crossback chair rentals! We are so excited to unveil our French crossback chairs for rent! These oak crossback chairs are oh so beautiful–I’m even going to steal one to place at my dining table. They can be found at high end furniture stores around Washington D.C. and now, we are offering them as rentals for your special event or wedding. Each French crossback chair has a woven rattan seat and we are hoping to get cushions to offer as an option as well. I hope you are crushing on these French beauties as much as we are! Also coming soon for this wedding season– French farm tables (with a gorgeous raw finish), whitewashed Chiavari chairs, and white and natural church pews. 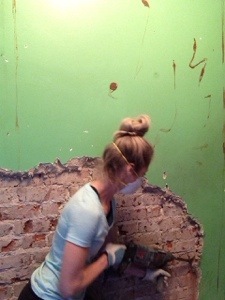 Something Vintage Rentals’ new studio under construction! 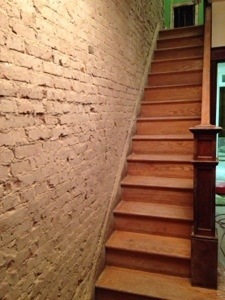 About a month ago, my studio and I moved into a 1926 rowhouse in the H St corridor in NE DC. This rowhouse has so much character– it has all the original oak floors, woodwork, doors, bathtub, subway tile, metal kitchen cabinets, and a beautiful porcelain farmhouse sink. That said, it needs a lot of work to make it into a lovely home and studio. I’ll post updates on the latest projects I’m tackling here(and my insanity for taking them on!). I’m hoping it will show case my penchant for taking something old and ordinary and transforming it into something to treasure. 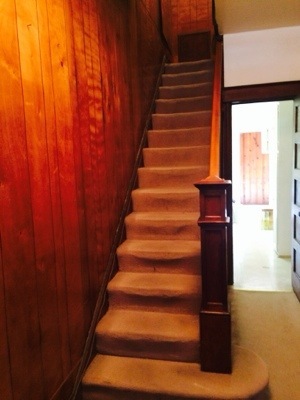 Here is one of the first projects I took on–ripping up ratty old carpeting and taking down the wood paneling from the stairs. 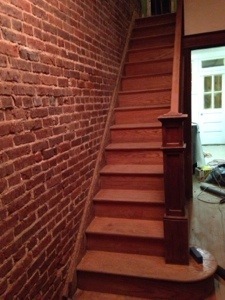 Underneath I discovered glowing green plaster and beautiful oak stairs (score!). It really lightened it up but the green had to go. 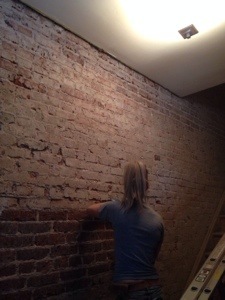 So rather than painting, I decided to go for it and just expose the brick. I have done this before so I knew what a mess and large job this would be. Luckily, I had the help of my crew members from Something Vintage. 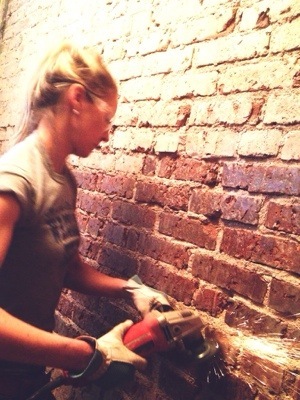 After 3 days, 71 contractor’s garbage bags full of plaster, and soooo much plaster dust (like .25 inches on everything in my house), we exposed some pretty awesome brick! I definitely need a manicure after all of that–my hands are a disaster!! 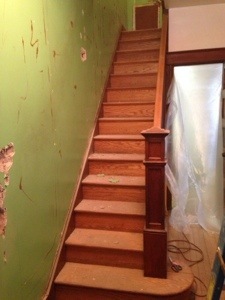 Here are the stairs before I got my hands on them. Pine paneling floor to ceiling and some well-worn carpeting. So I decided to take matters into my own hands and start taking off the plaster. Oh that brown stuff on the walls is the glue from the paneling. Very appealing, yes. So after tons and tons of work and plaster dust, all of the plaster was finally off. The next tedious step was cleaning each individual brick. I debated whether I should leave it that white color with the plaster, but by the time I sucked all the dust off, it was very pretty anymore. So I got to work….and got to buy a fun angle grinder for this with a wire wheel attachment! You can see what it looks like before I cleaned it (top) and after (below).